I’ve tried to come up with a catchy title for this commentary, This Time is Different, The Market Meltdown (That Wasn’t) but ultimately Lee walked into my office last week and said, what do you think about this Trump rally? Hence the title of this article. As you recall from my previous commentary, I stressed the importance of keeping your political and investment mindsets separate. This market rally is one of the reasons why. Sure, it could have been a drop, and honestly, a little part of me was hoping we would have gotten a bit of a pullback so we could have made some additional purchases at lower prices. So the real question is, What now? The rally we are experiencing has been great; there isn’t much uncertainty about that. There are, however, a few indicators that remain in negative territory, and I would feel much better about this rally if they would switch to the positive before getting too excited. One of the indicators that I use scores and ranks all 500 stocks in the S&P 500. It ranks them from a 1 (strong sell) up to a 5 (strong buy) using a multi-factor approach. The ratio between 1’s and 5’s gives us a picture into how many companies are driving the market higher or lower. In reviewing this chart, I want to see the green line go above 200 to signal a bullish bias to the market. Currently, the red line is above the green line giving us a bearish signal, although the end of last week saw the indicator start to reverse in a positive way. 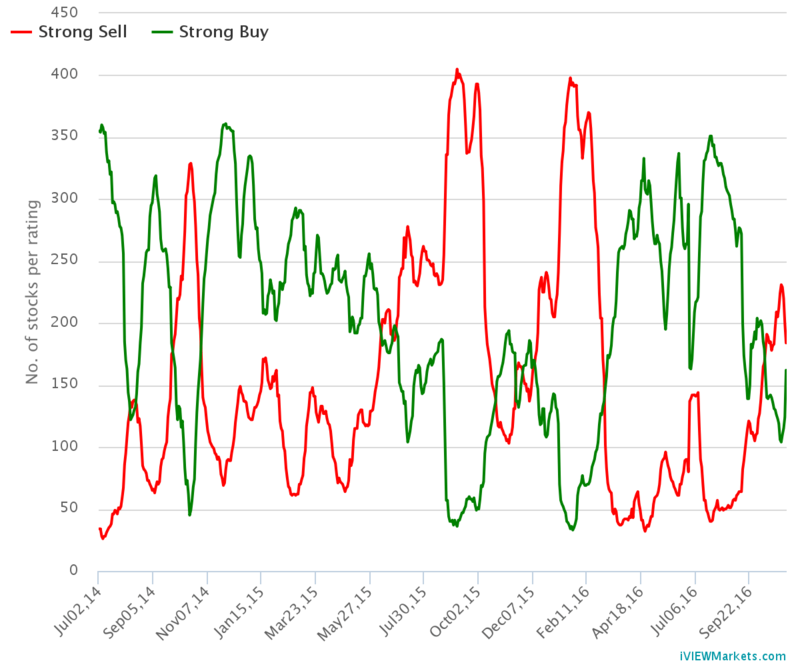 As the chart illustrates, there are more strong-sells than strong-buys. As long as this ratio has more sells than buys it will be hard for the market to continue to move higher and caution remains warranted. There is always competition for capital. So capital is continuously migrating to where it is perceived to be working most efficiently and profitably. We can think in terms of two big camps which are competing for capital in the domestic economy; Main Street and Wall Street. When the economy is slow and running below its capacity to produce, Main Street has no incentive to invest in new plant, equipment or to hire additional employees. The Fed pumps money into the banking system and it goes toward Wall Street speculation. During this time Wall Street is paved with gold and Main Street is full of pot holes. When the Animal Spirits of speculation are at work on Wall Street it is a very exciting time. Eventually that capital starts moving to Main Street (as the economy improves) when value and opportunity emerge. This shift of capital is important to us as investors. It does not mean that Wall Street is set up to fail. What it does signal is that money is in motion. It is shifting from the darlings of Wall Street (i.e. Facebook, Amazon, etc.) to Main Street stocks like Caterpillar, Ingersoll-Rand, and Deere. When Main Street begins to demand capital for growth the result will be new plants, filled with new equipment, and new employees to produce goods and services. Roads, bridges and infrastructure will be upgraded to move more goods. Expect the level of inflation to begin accelerating as more ‘stuff’ is being manufactured. Also, the cost of money (interest rates) will rise as the competition for capital heats up. Bond prices will fall as interest rates rise, Watch commodity prices and bond prices to further confirm that the Main Street theme is emerging. Here’s what we are doing about it within our managed account strategies. We are executing a bottom-up evaluation of every investment we own. At the same time, we are analyzing each market sector looking for leadership. If we confirm that capital is truly shifting from Wall Street to Main Street as Bruce Fraser stated, we want to have our shopping list ready once our indicators give the all clear. Until then we continue to be patient.